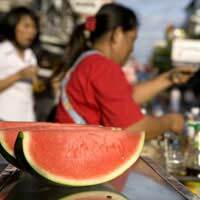 Compared with India and China, Thailand has a comparatively short culinary history. The people that became Thais migrated south from what is now the Yunnan province of China between the 6th and 12th centuries. From the 13th century, the earliest period of Thailand's history, there were only four culinary techniques in use. Food was boiled or grilled; it was preserved and ground into dips; or it was eaten raw. There were abundant supplies of fish and seafood, as well as fruit and vegetables, and these were eaten with rice as an accompaniment. The food was spiced up with black pepper and meals were simple shared affairs. With its position at the cross-roads of east west sea routes, Thailand was ideally placed to experience and absorb the cuisine of other countries. The Thai people took what was best from India, China and the Middle East and infused it with their own herbs and style with the result being the unique Thai cuisine. Instead of the ghee used in India, Thais used coconut oil to cook the spices that were the basis for curries that became part of the Thai repertoire, while noodles, a staple of Chinese cuisine, took a role of equal importance in Thailand. Woks were also introduced from China and with them came the new frying method of cooking. Nowadays Thailand is famous for its very hot dishes but before the 17th century black pepper was used for adding heat to a dish. Chillies were introduced into the country by Portuguese missionaries who had discovered a taste for them in South America. Tomatoes were also introduced at about the same time. Strong spices can overpower a dish but the Thais learned how to enhance the dish, while cooling it down, by adding indigenous herbs. In a typical Thai meal all the dishes will be served simultaneously so the different tastes can complement each other. The Portuguese were also responsible for the now-renowned Thai sweets made from egg yolks and sugar. The Thais worked using their own native ingredients alongside the newcomers to create new and distinctive flavours. Thai food typically incorporates all 5 tastes - sweet and sour, spicy and salty, and bitter - resulting in a meal that is fragrant and flavoursome. In a traditional country home, Thai people sit on the floor, the men cross-legged while the women kneel with their feet pointing away from the food, which is simple and shared. At a royal banquet, however, the food is anything but simple! The preparation of food and, in particular, the carving of fruit and vegetables has become an art form in its own right. Begun in the royal courts, food carving became a skill that no aristocratic lady could be without. The presentation of a meal was - and is - considered as important as the taste. Although food carving reached its peak during the 19th century, a royal banquet today is still a sight to behold. And these days it's not just for royalty. Since a political revolution in the 1930s, this art has been taught in schools. One hundred years ago Thais were eating their meals with their hands, rolling rice into balls and dipping it in sauces. Today they might use a spoon and fork, or chopsticks for noodles. The Buddhist influence has meant that meat is usually served in small chunks or shredded so there's no need for a knife. Thais will hold the spoon in their right hand and fork in the left, pushing food onto the spoon and putting the spoon into the mouth. By being willing to experiment, learn and adapt, the Thai people have created a great cuisine that is fragrant and delightful to all the senses. Its reputation and increasing worldwide popularity is well-deserved.